This is our page where you can learn how to bend tubing accurately with your new model 600. Just like real college, we show you the old school way to do it and some theory before telling you that software can do it all for you. But you can skip right to the end if you want to, we sell the best bending software there is, and it is quite affordable. In bending 101, you will learn how to put a bend where you want it, based on where the bend starts, and how to bend the right amount. The Rogue Fabrication bender has a fixed bend offset for every radius of die. 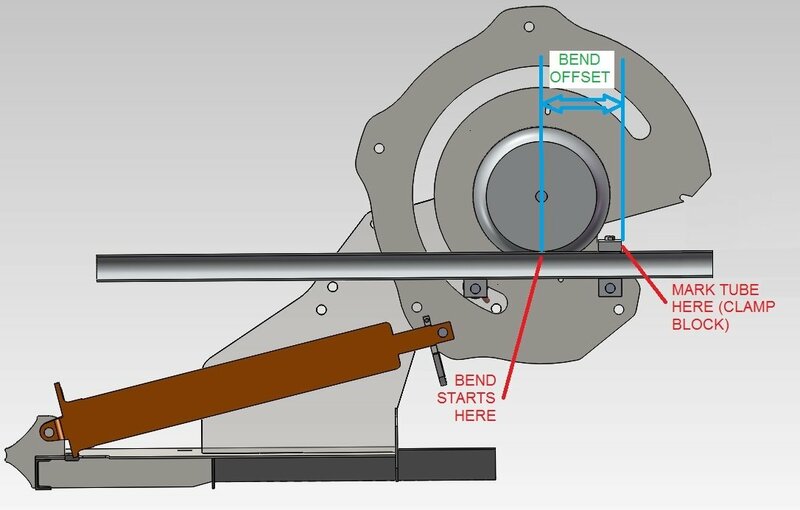 The bend offset is the distance between the start of the bend and where you line up the tube in the machine. See the image below. If you want to make a bend on a 4.5 radius die, and you want that bend to be 10 inches from the end of a piece of tube, mark a line on the tube 10 inches from the end. Your BEND STARTS HERE. Now draw a line that is 5 3/16″ closer to the end of the tube from your first line (5 3/16 is the bend offset from the table below). This line you just drew is where you line up the tube with the clamp block in the machine (“MARK TUBE HERE” in above image). The bend will start at exactly 10 inches from the end of the tube. Putting bends where you want them accurately is the foundation of accurate tube work. Here is the best way to measure your springback- Put straight material in the machine and hand pump the ram until it is just barely tight but not bending yet. Zero the degree indicator. If you want to bend a 90, bend EXACTLY 90, and then release ram pressure until the material is loose in the machine. Tighten the valve, and hand pump the ram until it is just barely tight on the material. Read your degrees, we’ll say for example that you read the degrees at 86.5. Now overbend by the difference. So you bend to 90, snug the machine up, read 86.5, then bend to 93.5 and pull out the tube and you will be at EXACTLY 90 after springback. Now you can overbend every 90 on that material by 3.5 degrees and they will all be spot-on! Springback is different for every material. In bending 102, you will learn how to calculate the length of tubing in a bend, and also how to put a bend in the middle of a length of tube. What About Bend Length, or “Take-Up”? 0.104″ on 6.0 CLR die. For example, a 90 degree bend on a 4.5 CLR die is 0.078*90 = 7.068 inches. Want to know where these numbers came from? Easy, just Pi*CLR*2/360. Pi x Diameter is the circumference of a circle, which has 360 degrees in it. That’s why we do the bend radius times 2 and divide by 360. To keep things simple, just use the numbers per degree that we list in this section. Once you can put bends where you want them, understand springback, and can calculate the length of a bend, you can make just about anything. Take your time and remember to bend from the center outward until you get the hang of it. That will help keep all your parts symmetrical and even when that is your goal, like on most roll cage tubes. Now that you know how to calculate the length of a bend, and where a bend will start based on where you clamp it in the machine, you can easily put a bend in the middle of a piece of tubing. Lets say you have a tube that is 45 inches long, and you want a 60 degree bend (done on a 1.75x6 CLR die) right in the middle of it. Draw a line in the middle of the tube. Your bend will be .104″ long per degree, so that is .104*60= 6.24″. So draw 2 more lines, each 3.12″ from the centerline. This is where the bends will end. Now we just add the bend offset (5 7/8″ in the table from bending 101), and put a line 5 7/8″ from one of the lines that you drew to mark the end of the bend. When you load the material in the machine, line up the last line you drew with the face of the clamp block closest to you, and make your bend. If you can’t see your centerline mark, it’s loaded into the machine the correct way. It’s that easy. 1. Draw your layout full size with sharp corners and dimension it (you can draw it on concrete, cardboard, paper, etc). 2. Trace the bends accurately into the corners with the correct radius. Mark the beginning and end (optional) of the bends. 3. Put a mark on your layout in the center of the tube. This is where we will start fabricating from. 4. Move from the center of your layout to the right, draw a line 5” from the beginning of every bend (5″ is one of the bend offsets from the table in the 101 section, use the offset that matches your die and machine). Label these lines “clamp block”. Repeat this process to the left. What you will now have is the locations where you clamp the material in the machine to put the bends where they are in the layout. 5. Now cut your tube to length, and put a mark in the very center of your tube. The length is simply all the straight lengths from the layout added up, plus the “take up” A.K.A. bend length which can be easily calculated using the numbers given in the 102 section above. 6. Measure out from center and draw your clamp block lines on the tube (7.75” and 10.75” in the example above). 7. Grab the tube centerline. Load into the bender (from front) until the clamp block line is on the front face of the clamp block. 8. Make your bend per machine instructions. 9. Remove the tube and lay it on top of your layout. You will be able to see any error. Now is the time to account for any stretching that may take place. If your second clamp block location doesn’t seem to be as close to the bend as you drew it, you may draw it closer and maintain as much accuracy as possible. 10. Repeat this process until you are done bending your layout. If you cut your tube to the full “sharp corner” length, You will have to cut the ends after you are done. Doing that would result in you having a longer cut length. This may be okay if you want to keep things simple and don’t mind a little waste. The following paragraph is a VERY DENSE explanation of another way to bend the same shape drawn above in Bending 103. We’re going to bend from one end to the other, starting with the 90 degree bend (following the same layout from the 201 section). We want a 10 inch leg with a 4.5” bend, so we need 5.5” of straight tube (5.5″ tube, 4.5″ in the bend since it’s a 4.5 CLR die). Our offset is 5” (use the correct number for your machine from the table in the 101 section) for a pre Nov 2014 machine for a 4.5” CLR die, so hang 0.5” of tube out of the end of the clamp block and bend 90 degrees. The bend length from the table is .078 per degree, So for our 90 that is .078*90=7.02 inches. It is another 28.5 inches from the end of the first 90 to the beginning of the next bend (add up the dimensions in the drawing). We can put the clamp block 28.5-5 inches from the end of our first bend, or we could have drawn a line on the tube before we started that was 5.5+7.02+28.5-5 inches from the starting end of the tube and used that as a clamp block location for bend 2. Clamp on the second line and bend, and you’re done. Don’t forget about springback. Bend Tech makes several levels of software to help you run the design and manufacturing side of your business or get your project completed. 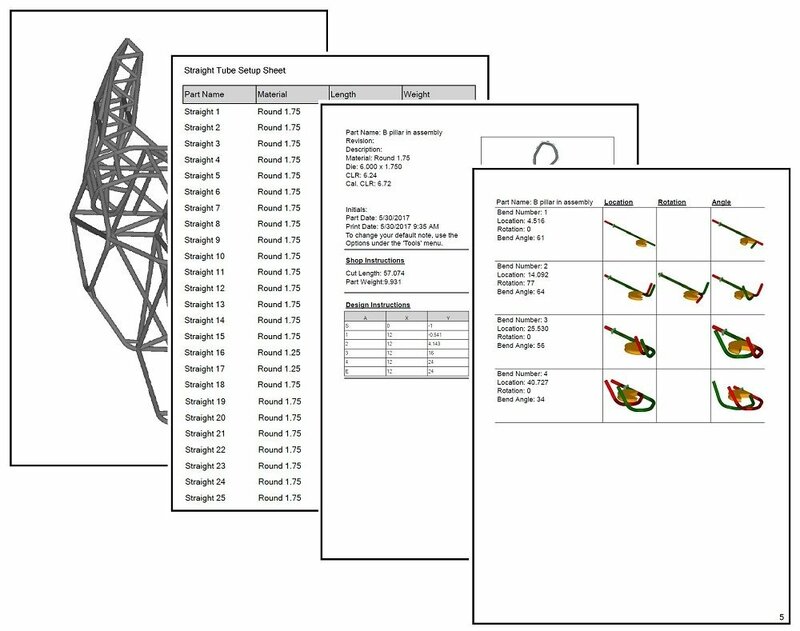 Our SE (standard edition) commercial software for tube & pipe design/ manufacturing. If tube bending is part of your company’s business or you are serious about tube bending, then Bend-Tech SE is where you want to start. The big deal: Export to CAD systems! If you are designing chassis, roll cages, rock sliders, frames or anything from single parts to multiple tubing assembly then Bend-Tech PRO is where you want to start. The big deal – full assemblies and notching. If you need a few single parts bent with rotation, EZ3D is a start. 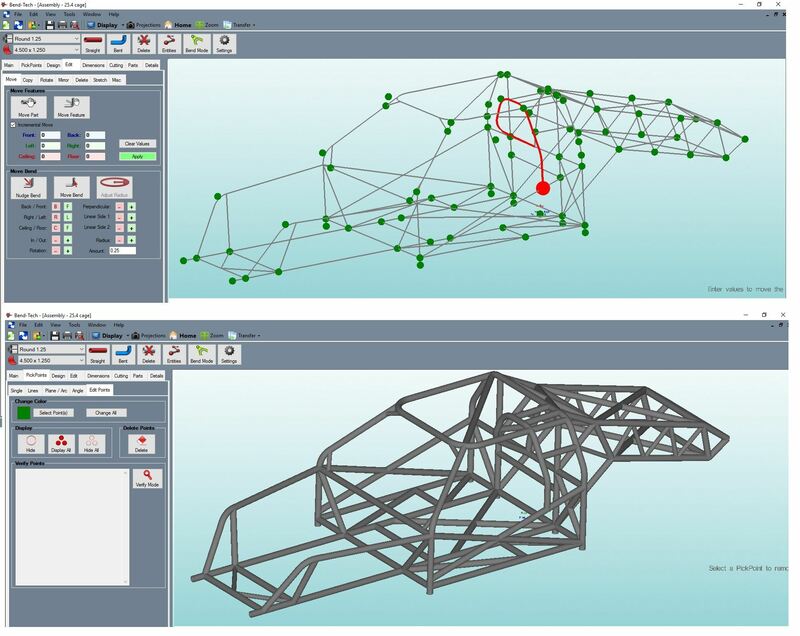 EZ3D is also useful if you won’t be fabricating multiple tube assemblies such as roll cages, bumpers, etc. The big deal – 3D parts made accurately. If you are planning to bend just a few parts in a year and the parts are 2D single parts, then EZ may do the trick. 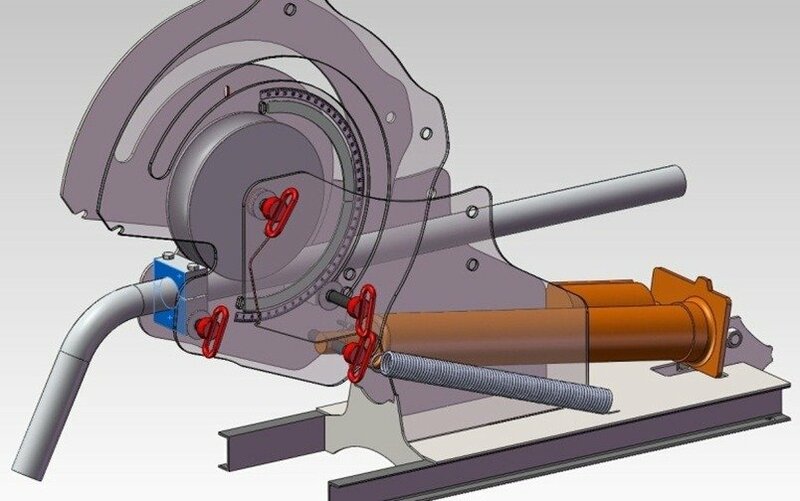 You can draw tube by hand or in SolidWorks or other CAD software, but none of them will generate manufacturing instructions. Bend Tech will print you a sheet of paper for every part with how long to cut it, what material to use, where to put the clamp block to get bend locations correct, and how many degrees to bend (including compensating for springback). Furthermore, PRO and SE will print cutting wrappers to help you with tube notching, and will generate sheet metal panels from just clicking on the tubes you want to make panels to fit. There are seriously too many useful features to describe in one little paragraph. You can adjust bend order on parts, scale parts, scale assemblies, etc. Who Can Learn Bend Tech? If you can use most computer programs with training, you should have no problem running this software. It is not “MS-Paint intuitive”… So don’t think you will be up and designing your chassis in 5 minutes. This is more like MS Excel. Go online and watch a video or read about a function and it will tell you where that button is and what it does. Watch the 30 or 40 minutes of videos on Bend Tech 7.x PRO and you can easily learn to design 3D parts, put them in an assembly, move them, edit them, print instructions, make more parts off that seed part, and use parts to cut each other to make perfect tube junctions. Fire up Bend Tech and chose the M600 and dies in the die library, they come pre-loaded. Add your material to the database (like 1.75″ diameter .120″ wall tube), and click on “calibrate die”. Bend Tech will tell you to cut a chunk of tube and tell it the exact length. Then bend a 90 degree bend anywhere in the tube. Tell bend tech where the clamp block is from one end. Then set your “L” on the table and measure the height with a tape measure. Flip it and measure the length of the bottom of the “L”. Put those two lengths in Bend Tech and it will calculate the amount of of stretch per degree on that tubing, the effective CLR (a 6 inch radius die bends bigger than a 6 inch radius with material elasticity), and use these values EVERY time you select that material and die. Now bend tech will actually use the calibrated values to determine more accurate bend locations, and exact bend lengths to make your designs accurate down to the fractions of inches that your tubing stretches when it is bent. And Spring back? Easy! Bend any 2 amounts and tell bend tech the springback amount, and it will interpolate the entire bending range to tiny fractions of a degree. So you bend a 35 degree bend (on the degree indicator), back the machine off and advance it until the pins are snug to read springback (see above in bending 102 for more info on springback), and you get a 32 degree net, so 35-32 is 3 degrees of springback. Tell bend tech you lost 3 degrees on a 35 degree bend. Now do it again at some bigger number, like 100. Tell bend tech the springback, like 5 degrees for example. Bend tech will use these two points to calculate the entire range of possible springback values and you call tell the software to take them into account (by checking a box) when you print your part manufacturing instructions. So it will say “bend angle 38 degrees” when your design is for 35, so it comes out correct. No more bending twice to compensate/measure for springback!